Everything was beautiful, nothing hurt. I know nothing and I persisted in the faith that the time of cruel miracles was not past. For there can be neither end nor beginning. And I have by me, for my comfort, two strange white owers— shrivelled now, and brown and at and brittle—to witness that even when mind and strength had gone, gratitude and a mutual tenderness still lived on in the heart of man. 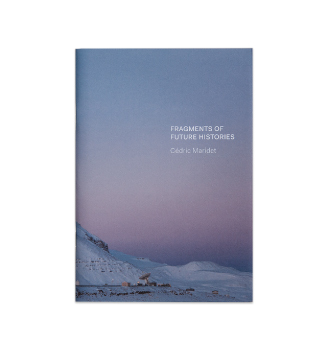 “Fragments of Future Histories” is a collection of videos, objects, installations, photographs and sculptures that embodies Cedric Maridet’s practice that relies on intensive field works and research from literature, science or history. Inspired by fieldwork in the Arctic Circle and especially in the abandoned Russian mining town of Pyramida in the Archipelago of Svalbard, the works unfold a mesh of narratives based on the poles and Mars’ explorations to form new fictional encounters where past and future coalesce. The exhibition induces an investigation of the connections between man and the exploration of his environment.